Three Piece receive a lot of business through an online platform called Add To Event, where users request quotes from suppliers for their services. In this case, the clients were a bride and groom requesting quotes for a very specific selection of wedding cocktails on their big day; espresso martinis, rhubarb gin and tonics, Moscow Mules. So we responded with confidence, knowing that we could deliver a high-quality service due to Alex’s experience as a barista and Dan’s experience with infusing and ageing spirits. As we already knew the date, time, location, amount of guests & drinks expected, our conversation went straight to the finer details about the drinks. It was clear that the clients wanted to create a wedding with quality in mind, but a stripped back service that encouraged a relaxed environment. We discussed using premium spirits and mixers, as we always prefer high-quality cocktails, but also agreed on made-to-order espresso martinis & self-service for the G&T’s or Moscow Mules. The clients helped immensely with their clear and concise communication online, wording email with consideration and taking the time to explain details in full. We believe that ‘with better communication comes better results’, and this was proven thanks to regular phone calls, consistent groups emails and an advance meeting at the wedding venue, Loft Studios. With 3 months to prepare, we had plenty of time over the summer period to organise all the necessary details effectively. 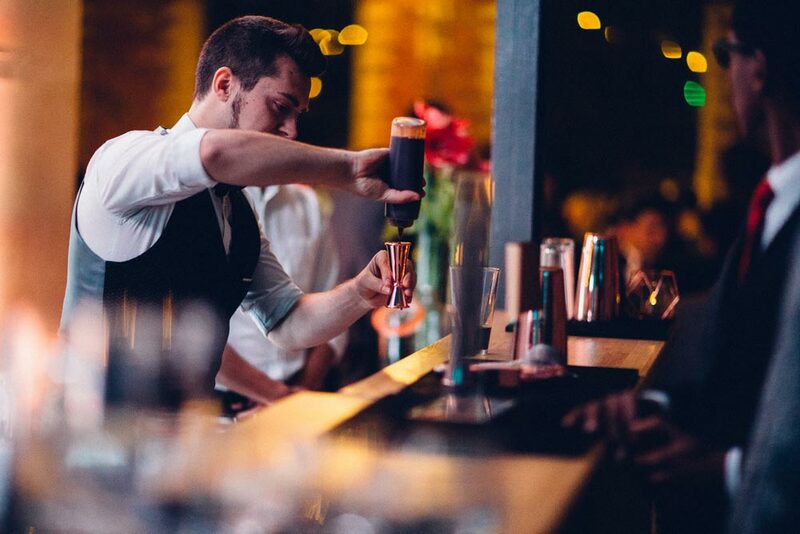 For large events we prepare the bars early to ensure time for any complications that may not be foreseen. In this case we arrived around midday to set up, ready for an early evening start. Working with the venue staff, we set up the bar units in the allocated space and adhered to all their safety checks such as floor protection, sufficient lighting and electricity safety. This took less than 1 hour so we stocked the bars ready for service and returned after the ceremony, in time for dinner. We didn’t serve the table drinks as catering companies often include this in their packages, but we helped with the storage and corkage of wines & beers as a friendly gesture. The clients asked for three types of cocktail; one made to order at the bar and two self-service from an adjacent unit. The benefit of our custom packages, beyond being all-inclusive, is that we are able to adapt our service for this situation and deliver the products to the highest standard for a reasonable price. In this instance, we reduced the price of the self-service cocktails because they were easy to build, but charged the client a premium for creating a home-infused rhubarb gin using Portobello Road. The self-service drinks were dispensed from large Kilner Jars with mixers, glassware & ice buckets next to them. 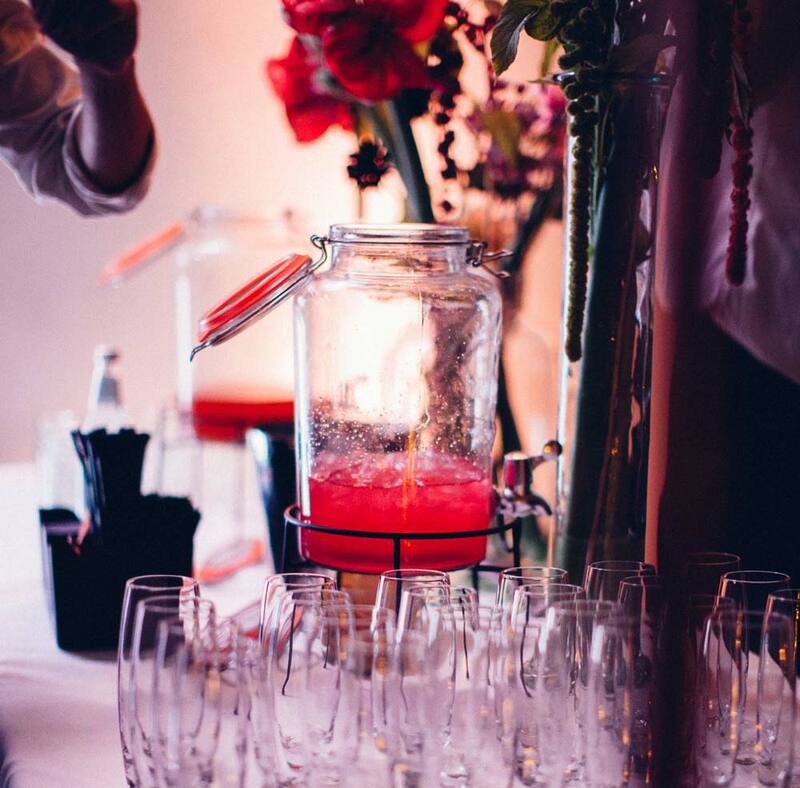 The guests were able to serve drinks at their own leisure, in whatever way suited their tastes best, which enhanced the relaxed feeling that our clients were trying to achieve. For the Martinis Dan was stationed on the central bar unit, making up to 6 martinis at any one time thanks to the simplicity of the recipe. (Note: most Martinis are very easy to make in bulk as they require little ice, therefore the bartender can fit more in their shakers.) This kept guests happy and a good flow of foot traffic around the bars, because we all know it’s not fun waiting in the queues. Aside from this, we used another bar unit to serve wine and beer provided by the clients for those who were not keen on cocktails. We didn’t charge extra for this as it requires no skill and little effort from our staff, simply a smile with the service. For this event, in particular, we spent over a month in preparation, testing rhubarb/gin ratios and even testing different methods. To decrease the sugar content of the Gin and Tonics we opted to use our slow-infused rhubarb gin, instead of adding rhubarb-infused sugar syrup to G&Ts. This was not only a slightly healthier option, but the consistency of the mixture, the vibrancy of colour and strength of flavour were vastly improved. For our espresso, we used a speciality coffee blend from Fred & Ginger Coffee, where Alex works as a professional barista by day. He extracted the coffee himself that very morning and ensured it was perfectly stored, ready for service that evening. We faced a few problems with the delivery of the self-service drinks but found efficient solutions that both the bride and groom were happy with. First of all, we suggested copper mugs for the Moscow Mules as this is the traditional way to serve them, but we couldn’t find a supplier anywhere in London who had 120 for hire… unbelievable! Therefore our solution to this was to serve in recycled jam jars which we collected over a couple of the summer months, demonstrating the importance of planning events well in advance. Secondly, the clients asked for self-service drinks to be pre-mixed in the Kilner Jars. However we warned them that this would have a negative effect on the drinks as the mixer may go flat over long periods of time and there simply wasn't the space to fit it all in a Kilner Jar, even though it had a 5 litre capacity. The solution was to calculate ratios of spirit to mixer and give staff the responsibility to top up regularly. This also allowed for more interaction at the self-service station and helped build a better rapport between staff & guests, which we love! Another unforeseen problem was a delay to the schedule as dinner and drinks did not finish until 21:00. Naturally we went ahead with service, delivering our drinks for the time agreed. Moreover, towards the end of the event the bride and groom asked to extend the evening because the guests were enjoying the atmosphere so much. Alex spoke with the groom and agreed to extend the drinks service for another hour and a half, whilst clearing and removing any excess equipment, so that guests could continue enjoying the drinks package right to the end. This solution not only pleased the bride and groom but also allowed our team to clear up casually without interrupting the guests’ moves on the dance floor! Three Piece love weddings as that’s where the business started. 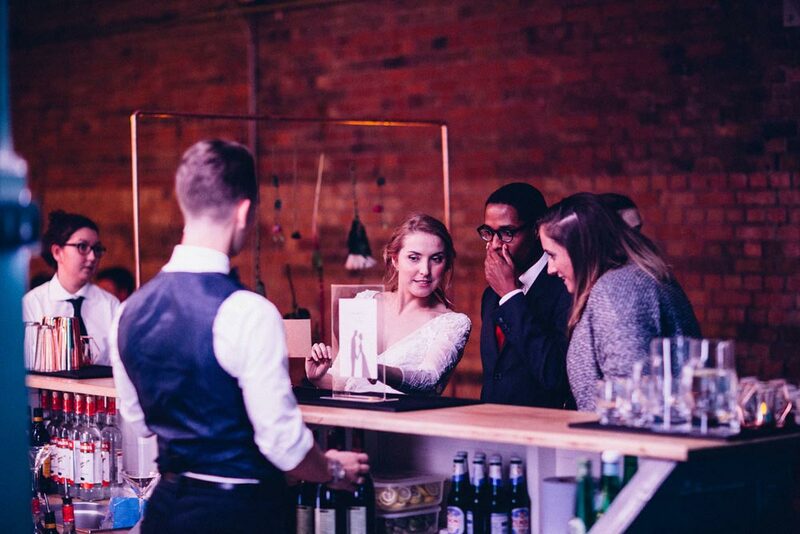 Our goal is to be the number one pop-up cocktail bar service in Hertfordshire, serving at every major wedding venue in the county. So in 2018 we want to impress even more couples on their big day by serving drinks that go above and beyond what is expected. We are in conversation with new companies to step up the quality of drinks service, with unique packages that will amaze every bride and groom.